My favorite part of moving is settling in. Finally. All the rush-hassle of packing, arranging movers, schlepping items to the Good Will or new home and living with ceiling-high piles of boxes subsides. Energy slowly creeps back, each day a sliver closer to being able to walk and think without creaking. Figuring out where everything goes, the human trail of do-dads and odds and ends and artifacts and books and notebooks that I drag from home to home like a colorful kite I hope to fly. My sister and I are both our engineer father’s daughters, with an innate sense of organization. An ability to be both creative and logical. Just as I can organize a story in logical fashion and my sister a website, we can also figure out the most efficient way to lay out and store items. And to make them look good too. Each new home presents a unique set of challenges. What worked beautifully in one kitchen, such as putting all the pots and pans in a cupboard next to the stove, doesn’t work in another, with the stove cupboard so narrow it will only hold a wire rack. Or the bizarro cupboard with 6-inch deep shelves that worked for cookbooks now replaced by a pull-out wood tray that wobbles and sticks and makes all the plastic ware fly out onto the floor. My sister is fortunate enough to have designed her kitchens and other spaces to exact specifications. She takes a place for everything to a level that would have awed our OCD father. That is a challenge, of course, just as working with what’s there is also a challenge. 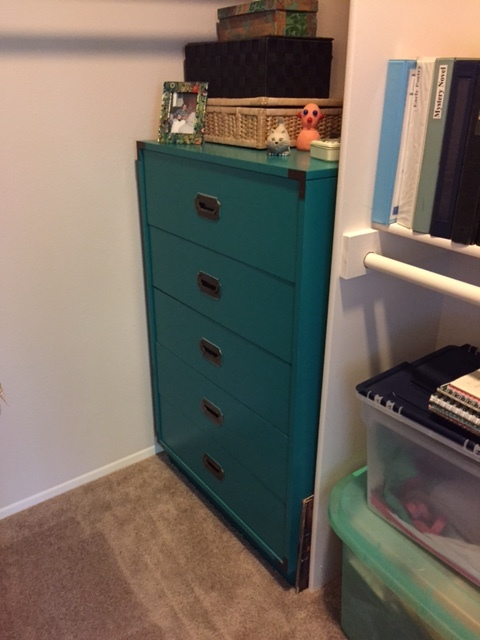 So far, I have really lucked out with the turquoise bureau. Originally enamel black with a slight Chinese accent, my mother bought it after dad died and she moved into a modern condo with a whole new look, including bright red and green glossy tables. It was her bedroom bureau until she married our step-dad. I think he used it for awhile. When they bought a larger house, the bureau was moved into the guest room and painted white. A neutral palate for neutral guests, or for those of us in the family needing safe havens, including me, my son, and my niece (at different times). After our step-dad died and mom coped with running a big house by herself, I didn’t have the heart to say anything about the bureau. She finally agreed to downsize close to my sister and the time came to give away much of her furniture. I asked for the bureau and my younger son transported it in his truck from Hermosa Beach to La Jolla. I had the perfect spot for it in my office, a little alcove in the wall. And I knew right away it should be painted turquoise, my favorite color. I hired my artist-photographer-musician friend Patrick to do it – bright shiny enamel. It pleased me to look at it every day and know it held all my office supplies beautifully. Then I moved around the corner and what do you know, there was an alcove in that office too! And now, two years later, I move again. This time I have a walk-in closet off my office – and the CLOSET has an alcove for the bureau. They were made for each other. The moving guy couldn’t believe it when he hefted it in. Yes, some things are a perfect fit, fall into their right place.